The re-authorised US GSP scheme enabling duty free exports will become effective for Sri Lankan exporters from 22 April, Minister of Industry and Commerce Rishad Bathiudeen said. “This initiative greatly strengthens relations with our biggest trade partner in the world and helps not only our exporters but US importers and US consumers as well,” he said. 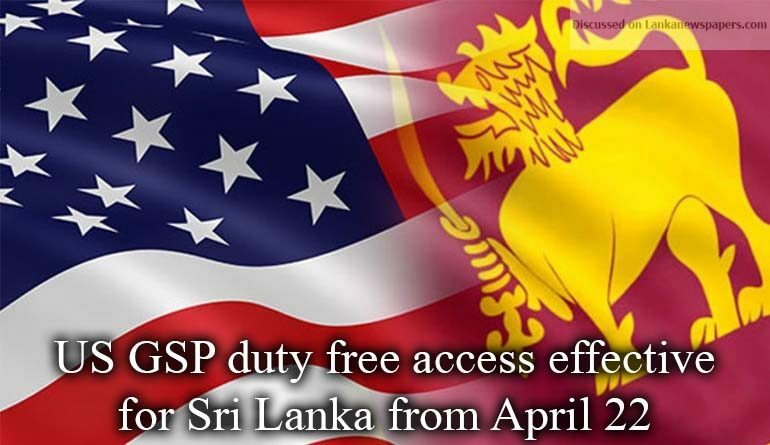 Sri Lanka will now benefit from the renewed US GSP Scheme until 31 December 2020, a ministry statement said. US President Donald Trump re-authorised the US GSP facility for 120 beneficiary countries when he signed the US Omnibus Spending Bill on 23 March. His re-authorisation opens opportunities for around 5,000 products to be imported to the US without tariff from 120 developing countries. The scheme had not been renewed in December 2017. The commerce ministry also said US importers are eligible to claim customs duties they had to pay during the period of inactive GSP from 1st January 2018 to 22nd April 2018 due to the retroactive effect of the US President’s renewal. It also said Sri Lankan exports to the US are now almost at the $3 billion threshold for the first time, up 3.65% from 2016’s $2.8 Billion. The US has been the leading buyer of Sri Lankan exports over the years and it continued its lead even last year. Apparel products are Sri Lanka’s biggest export item to US, taking around 70-75% of annual exports. Total US-Sri Lanka trade (both exports and imports) in 2016 was US $3.3 billion. The second largest buyer of Sri Lankan exports last year was UK at $1.03 billion and the third, was India at $689 million.